We are the largest private sector airport concession operator in the world based on the number of airports under management and the tenth largest private sector airport operator in the world based on passenger traffic. In 2018, our airports served 81.3 million passengers of which approximately 33.7% were international, approximately 55.3% were domestic and approximately 11.0% were transit passengers. The airports we operate are located in countries with compelling macro-economic trends and in key cities within those countries. We have developed a global platform with deep operational expertise and resources to support our organic growth plan and our global expansion strategy. To manage our current assets, we employ teams across architecture, aeronautical and commercial activities, corporate and project finance, accounting, legal and government affairs. Our size and scale allow us to maintain these resources in-house, thereby allowing us to address opportunities quickly and efficiently and provides a competitive advantage. We will continue to seek additional attractive airport concessions both in our current markets and new markets where we can leverage our experience and local market knowledge. We also look for opportunities globally where we see markets that are under-served and where we can also leverage our competitive operational strengths. We undertake continuous and detailed analysis of our aviation markets in order to add new routes and increase frequencies. Furthermore, we maintain long-standing relationships and active dialogues with all major airlines and airline alliances operating at our airports. We also analyze developments in aviation technology as new generations of airplanes with greater ranges that allow for new routes are introduced to the market. We continuously look for opportunities to increase our revenue in strategic locations by developing new infrastructure. We have the ability to increase air traffic demand through the construction, expansion and remodeling of terminals, platforms, runways and taxiways. The construction, expansion and remodeling of our terminals also serves to increase our commercial revenue by adding new areas for duty free shops, retail stores, restaurants, and more. We work closely with the airlines using our airports to maximize operational efficiency, minimize time on the ground and avoid flight delays. 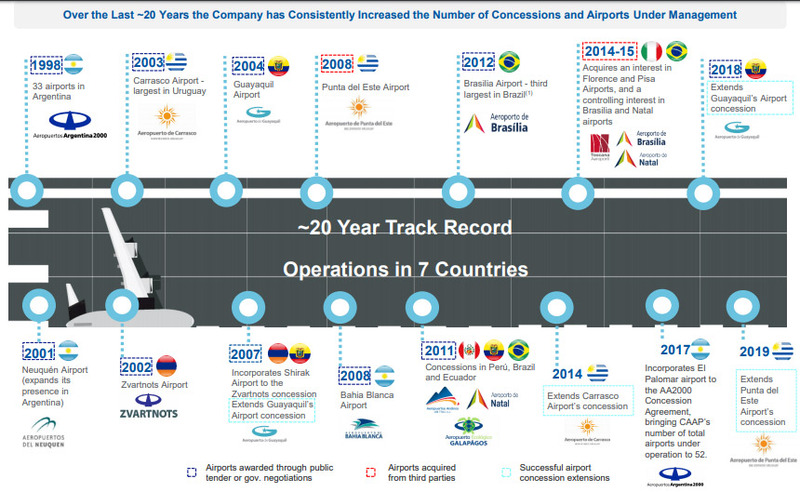 Also, as a result of our extensive experience operating airports of different types in diverse locations, we have developed a set of best practices and KPIs which can be shared across our current portfolio of airport concessions. In addition, we continuously monitor costs to identify reduction opportunities. © Copyright 2018 Corporacion America Airports. All Rights Reserved.